[Media is] the biggest competitor for our children’s hearts and minds. Last month the New York Times had an interesting article titled, Steve Jobs Was a Low-Tech Parent. In it, the author writes how Steve Jobs—along with a number of other technology chief executives and venture capitalists—significantly limited his children’s screen time. And why wouldn’t he? He’s seen the dangers and concerns of technology firsthand. Two-year-olds who are exposed heavily to screen time are more likely to become excessive television viewers by the age of six. The American Academy of Pediatrics found that TV viewing habits developed early in life tend to persist later in life. Before our son was born, my husband and I made a decision to keep television and videos out of baby’s first three years of his life. The evidence about TV’s adverse effects on children’s development is so overwhelming that we were determined to keep it out and give our child every opportunity to thrive. Instead of using technology to fire his neurons, we were forced to be more creative and tried lighting them up with real–life experiences: the sound of our voices (singing, reading and speaking to him regularly), the feel of grass under his feet, the smell of flowers, water running through his fingers. Our little one is now two years old and I think our decision to keep television and DVDs at bay has been one of the best things we’ve done to impact his early childhood development. As a stay-at-home mom without a nanny or family living nearby to help, admittedly, there have been times—baby was screaming; I had a deadline; I was busy in the kitchen; I needed to make a quick phone call—I felt like it would be so easy to put him in front of the TV for a short time so I could get some things done. However, I’m really glad I never gave in. The more I researched about the issue, the more committed I was to being a low-tech parent. Now, I also strictly limit my son’s exposure to the iPhone, iPad and computer. I know that eventually TV and other screens will be introduced in his life, but I’m pretty certain that the creative skills he’s learning to cultivate now, without the help of a screen, will be invaluable for years to come. As babies learn from using all of their senses, we’ve also tried to stimulate our son’s sense of taste by introducing him to culturally diverse cuisines. In my last post I mentioned how he ADORES miso soup and often asks for it at every meal, including breakfast! Although we have a great Japanese restaurant nearby, I decided I should start trying to make different types of miso soup. I’m hoping to come up with several versions of miso soup, not only because it’s simple to make and my son likes it so much he’d have it injected into his veins if he could, but also because I’m pretty sure our restaurant’s miso may not be fully vegetarian…. At first I thought the flavor combination (miso and tahini) was bizarre, but I was intrigued by the fusion of Japanese and Middle Eastern flavors. So I was happy to try it. I also liked the addition of delicata squash and avocados, favorites in our home. The two add wonderful texture and flavor to the soup. If you have a favorite vegetarian miso paste/miso soup recipe that you use regularly, please share! I (and my toddler) would love to know! Add the squash and turnips to a large pot, cover with water, and bring to a gentle boil. Simmer until the vegetables are tender, about 15 minutes. Remove the pot from the heat and let it cool just slightly. Pour a few tablespoons of the hot water into a small bowl and whisk in the miso (to thin it out a bit–this step is to avoid clumping). Stir the thinned miso back into the pot along with the tahini, and lemon zest. At this point, taste, and adjust the broth to your liking, it might need a bit more miso (for saltiness)…or more tahini. To serve, place a scoop of barley in each bowl along with some of the squash and turnips. Ladle broth over the barley and vegetables. 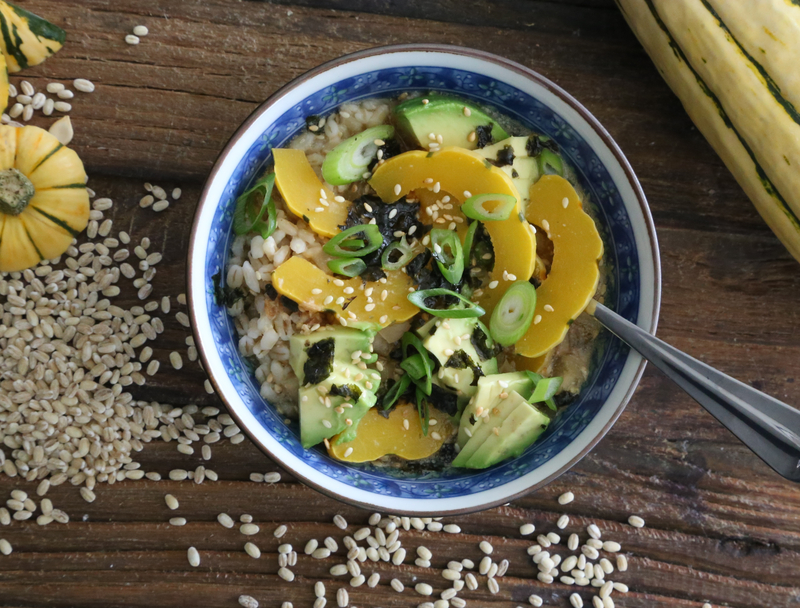 Finish with a few slices of avocado, a sprinkling of green onions, seaweed, and sesame seeds. If you have leftovers and need to reheat the soup, you’ll want to do so very gently. The nutritional benefits of miso are compromised when boiled. Notes: The original recipe from 101 cookbooks called for white miso, as I had a bottle of Three Year Barley Miso paste on hand the first time I made this I used it instead. It miso was quite mild so I ended up having to use a lot more paste and a little soy sauce. The next time I made this I used white miso paste, and it was a little stronger and tastier. If you try this, feel free to experiment with other types or blends of miso, keeping in mind that some are saltier than others. If you’re unsure, add the miso paste gradually. As mentioned above, if you have a favorite miso paste, please let me know. The original recipe called for 1/4 cup of tahini, but I’d recommend to start with less tahini, perhaps just a teaspoon and add more according to taste preference. Technically, you can eat the skin of any squash so kabocha squash, or any other winter squash, can be used as an alternative to delicata squash. However, please note the skin of some squash are harder than others. Delicata squash is nice to use here because it has a thin skin which is barely detectable when cooked.